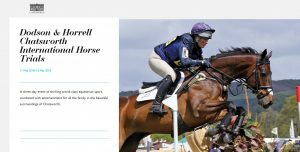 Join us at the Dodson & Horrell Horse Trials and enjoy world-class competition, from elegant dressage and exciting show jumping to gripping cross country. Explore the 2018 provisional timetable. You can also see the stars of the future in the Dubarry Burghley Young Event Horse 4- and 5-year-old classes. Back by popular demand is the eventing challenge, held in a grass arena, which sees competitors jump a course of show jumps, immediately followed by a round of arena cross-country fences with an optimum completion time. Penalties are incurred for knock-downs, refusals and time faults. Come and join us for a feast of entertainment with live demonstrations.